Good Evening! On behalf of my wife and my colleagues, I wish to extend my heart-felt thanks to Governor Wood, Mrs. Wood, Chief Minister Bell and all of you present. My wife and I deeply appreciate the invitation to visit the Isle of Man. We are most grateful for the warmth of the hospitality! I also thank all of you for your strong interest and active involvement in relations between China and the Isle of Man. This is my first visit to the Isle of Man. In fact this is my first visit to any of the Crown Dependencies since I took office as Chinese Ambassador to the UK. · China and the Isle of Man signed the Tax Information Exchange Agreement. · A number of companies of the Isle of Man have set up businesses in China or have their products made in China. · The Isle of Man has assisted many Chinese companies in joining the AIM Market of the London Exchange. · Our two sides also have cooperation in ship registration. · Next week, your Department of Economic Development will send another delegation to China. · The Ballakermeen High School and No.1 Middle School of Liuyang city of China's Hu'nan Province have become sister schools. · Teachers and students of these two schools have exchanged visits. So I believe it is fair to say that cooperation between China and the Isle of Man is promising and bright - like the spring season that is approaching. I understand that the special status of the Isle of Man as a Crown Dependency means it is not part of the United Kingdom. Yet relations between China and the Isle of Man are inseparable from relations between China and UK. · Last year, China-UK trade totaled 63.1 billion US dollars. · That was an increase of 7.5% on the previous year. · The two countries are working towards the goal of 100 billion US dollars by 2015. · Last year, Chinese enterprises invested over 8 billion US dollars in the UK. · That was more than total Chinese investments in the UK in previous years. 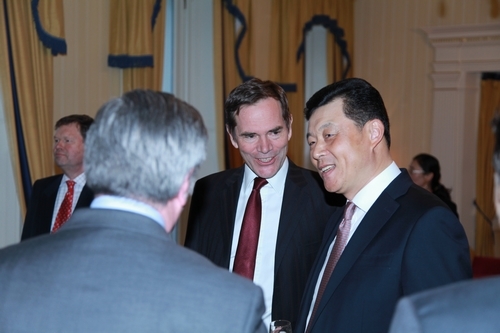 · Also last year, China and UK launched the high level people-to-people dialogue. · This mechanism has catalyzed fast growth of China-UK cooperation in culture, education, science and technology. These advancements in China-UK practical cooperation will offer favorable conditions and an enabling environment for further development of relations between China and Isle of Man. · One was the 18th Congress of the Communist Party of China – or CPC late last year. · The other was the first session of the 12th National People's Congress and the first session of the 12th Chinese People's Political Consultative Conference. · First was the election of the new Chinese leadership. · Second was the identification of the direction and goals for China's future development. · Deepen reform and opening up. · Achieve sustainable economic development. · Promote social justice and equity. At the same time, we will stay committed to the path of peaceful development and work with all other countries for world peace and prosperity. I am convinced that China's development will create more opportunities for the win-win cooperation between China and the Isle of Man. Let us join efforts to compose a new chapter in the cooperation between China and the Isle of Man and between China and the UK.